Tom Izzo and his Michigan State men’s basketball team are entering familiar territory. For the sixth time since 2008, the Spartans have advanced to the Sweet 16 of the NCAA Tournament. Many, including President Barack Obama, have predicted that MSU will wear the championship crown. Up next for Michigan State? A return trip to Madison Square Garden, where the four seed Spartans will face the one seed Virginia Cavaliers at approximately 10:00 p.m. tonight. The Cavs have had a very successful season, winning the ACC regular season and tournament championships. Michigan State head coach Tom Izzo described Virginia as a strong defensive team during a press conference on Tuesday. He emphasized that the Cavaliers have a big and physical roster. “They’ve gotten it covered in every way you can have it covered, and I think the bottom line is this is one of the best defensive teams in the country,” Izzo said of Virginia, which led the NCAA in scoring defense during the regular season, allowing just 55.5 points per game. The Cavaliers are led by sophomore guard Malcolm Brogdon, who was voted First Team All-ACC by conference coaches, and Second Team All-ACC by the media. During the regular, season he averaged 12.6 points and 5.4 rebounds per game. Meanwhile, sophomore forward Anthony Gill has helped Virginia during the NCAA Tournament with strong play around the basket. In the second round against Coastal Carolina, Gill scored 17 points and secured five rebounds. He followed up that performance by scoring 13 points and pulling down eight rebounds in a Third Round tilt with Memphis. Michigan State certainly won’t be intimidated by a matchup with the Cavaliers. Their combination of talent, experience and late season momentum has the Spartans poised for a deep tournament run. MSU excels on both sides of the floor, looking to push the ball on offense while sticking closely to perimeter shooters on defense. As always, Michigan State hits the glass hard for every rebound. The Spartans rely on senior forward Adrien Payne and junior forward Branden Dawson to control the game close to the basket. The pair has been dominant during the tournament thus far. Payne scored 41 points and gathered eight rebounds in MSU’s game against Delaware. 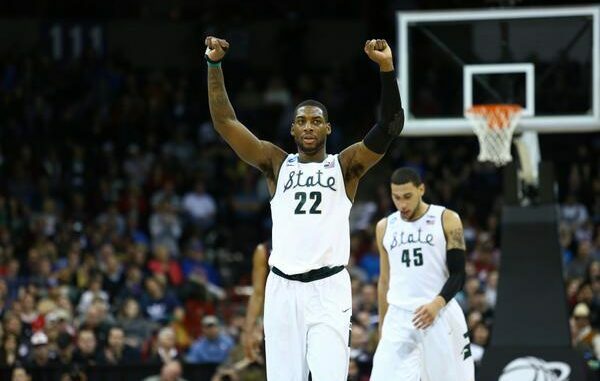 Dawson recorded 26 points and nine rebounds when Michigan State defeated Harvard in third Round action. Fouls have been an issue for MSU. Luckily this Spartan team boasts solid depth, especially on the perimeter. Izzo regularly rotates up to 10 players into contested games, including junior guard Travis Trice and red shirt first-year forward Kenny Kaminski. Both average well above 40 percent on three point shots. Payne and Dawson are most vulnerable to foul trouble. Not that they are more prone to infractions than MSU’s perimeter players, but that group can substitute and transition almost seamlessly throughout the game. Meanwhile, losing Payne or Dawson delivers a much more decisive blow. Their strong play around the basket is what gives MSU its edge. Most teams have at least a couple of somewhat talented guards on their roster. Not many teams have a player as effective as Payne or Dawson patrolling the rim. There isn’t a team left in the tournament with a combination as dominant as the Spartan duo. If Michigan State receives strong play from senior guard Keith Appling and sophomore guard Gary Harris, the Spartans are likely to come out on top. But don’t count out Virginia just yet.